Now here is a trend that is long overdue. Friendliness among customs and security people at airports. I know this may be hard to believe but I've seen it with my own eyes. Brief glimmers have been witnessed in other places, but several clear instances of cheery, friendly border people were in evidence on a recent trip through LAX to and from Baja. [Perhaps this group deals more with holiday travelers and business travelers; perhaps we are less snarky; but gosh they were friendly.] One guy made some jokes, I could hardly believe it. He was joking about the length of the lineup, and that yes, we did need to go through this even if we were just connecting to an outbound flight. One of the security screening people hinted that we could spend less time with them if we followed all the rules. Also laughing. I'm not sure what's happening, but I suspect that people are cluing in to the fact that none of this stuff is going to go away. How horrible must it be to work in an environment where you are expected to be a sourpuss all day. [To say nothing of all that smelly footwear.] Goodness knows it's horrible for travelers to deal with hostility in every airport. So I think we are witnessing a culture shift among the security staff and among customs and immigration staff, and boy is it ever welcome. No one is minimizing the security risks or the need for countries to control who comes into their borders. But the vast majority of us are simply tax payers, not threats. It's nice to be treated with some simple humanity. The US agency responsible for airport security, the TSA, has started a blog. It's actually fairly amusing, and has attracted a number of comments. 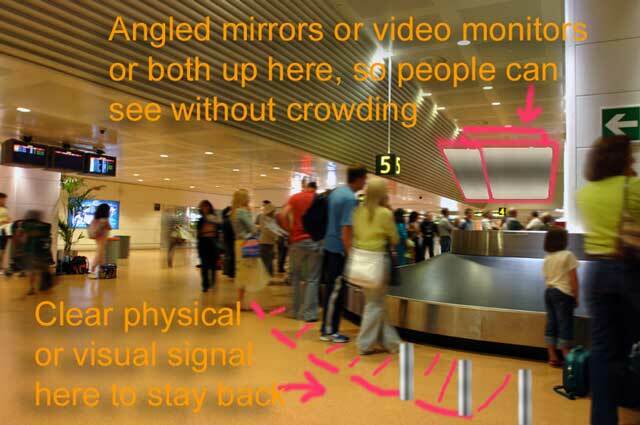 I found a surprising number of blogs referencing the who area of security screening. This is one of the common experiences of our time, and is universally hated. Check out a few of these stories. Buffalo Blood Donor on how to improve the experience: add some color. 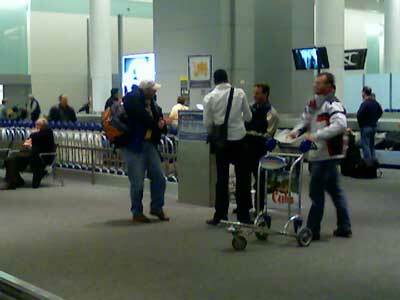 Germs on your feet at airport security. And yes, there's a company selling a solution for that. Frustration with priority line-hoppers, on Textually Promiscuous blog. As hotels continue the march up the sustainable innovation curve, they just get better and better, don't they? My current hotel started out as a motel on a strip development, but looks more like an oasis for road warriors now. Such pedestrian items as a blow-dryer, in-room coffee maker, and luxurious bed are now pretty much mandatory to stay in the game. Free parking and free in-room internet are among the distinctions between this kind of a place and a major downtown hotel. Even the quality of the restaurant food has improved, no longer smacking of diner-with-a-garnish entrees. These postcards could charm the kids you are traveling with, or the road warrior keeping in touch. The insight: when you are traveling, you are either having an adventure with family and friends, or you are lonely and missing them - or perhaps just knowing that they are missing you. The postcards neatly nail this insight and speak to it. So they win on two counts: they show that the hotel 'gets it', and they give you something nice to do with those emotions. I was also pleased to see a truly useful web site, with things like 'check your flight' and 'local dining'. Best I have seen in quite a while. Good on you, Holiday Inn. Or should I start calling you Holly, to reflect your new sensibility? See this line of people? They have already checked in ahead of time, like good customers. Now they want to drop off their bags. But there's no one there to take their bags. The floor-walking customer service person tells them several times "someone will be here soon". Meanwhile my companion and I try ticketing our own bags at the new kiosks. We can't seem to get them to work. Neither can anyone else. The people at our end of the counter take pity on us and offer to tag our bags for us, so we don't have to stand in the other line. My question is simple: why pay someone to walk around the floor "helping", when they could be actually helping. If you know what I mean. Off to get inspired at the conference, and pick up booty at the trade show. 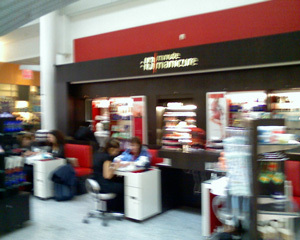 Seen at Pearson Airport in Toronto: 10 minute manicure. A great solution to boredom at the airport, and a little indulgence. Great concept. Sorry the picture is so blurry. Airport retail is a great place to see creative thinking in action. 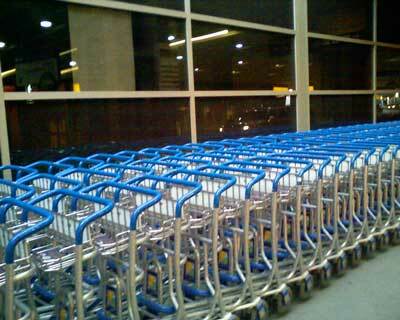 In Calgary, which has a very nice airport, and approximately half the landing fees of Pearson, the carts are free. 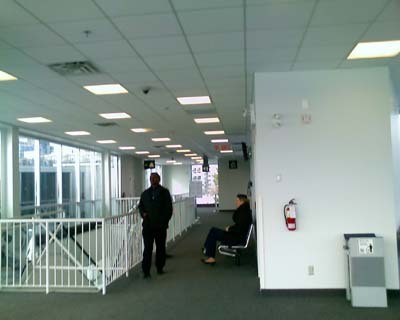 And present in abundance, both inside and outside the airport (see pic below). In Toronto, you have to press down the handle all the time to keep the wheels from locking up. [This is deliberate ... some kind of runaway-cart-prevention-measure thing no doubt]. You can see people all over the airport having trouble keeping their carts moving. Calgary's carts roll when you push them, with no extra complications involved. You can try to extract a few extra bucks from every little thing. Lots of businesses do it. And it can be a significant source of revenue. It can also make people feel nickle-and-dimed. This practice can turn the rental of a cart into something done only grudgingly. A grudge purchase is not a strong customer experience position to be in, is it? So if you are doing this, you should start asking yourself what gains you might make in loyalty by taking another route. Someone's got to pay for that giant airport, and I suspect there's enough revenue there that it would be tough to convince anyone to let people use the carts without a charge. An alternative would be to provide sponsorship opportunities for the carts. Hotels, local tour operators, local tourist attractions might all be willing to sponsor the carts. Or brands that stand for comfort and convenience, like TD Canada Trust. I would ensure that the whole thing occurred within some design constraints so that it would feel clever, thoughtful and interesting for travellers, not noisy and commercial. Any good agency could handle that element with ease. After all, an airport is the gateway to your city or your country. 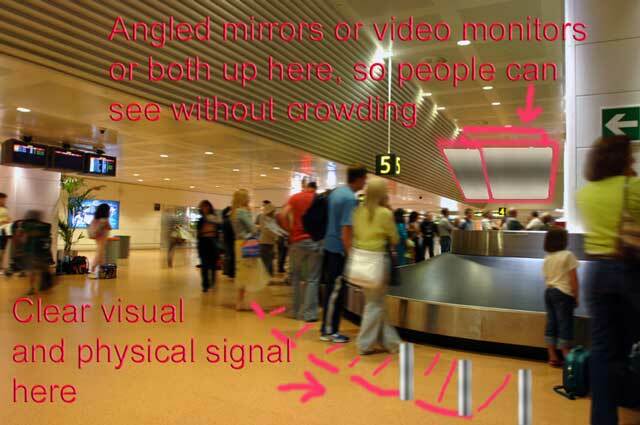 Do you really want people feeling irritated as soon as they get here? Poor things -- they had no idea they would need Canadian COINAGE just to use a luggage cart. This captain had a lot on the ball. To keep the masses distracted, he explained the process of de-icing, and why there are two different colors of stuff being sprayed around. He also de-fused any anxiety about the First Officer's visual inspection of the wings by telling us it was all "just part of normal procedures, and doesn't mean anything is wrong". He said they would get the in-flight movie going as soon as possible, and try to dig up an extra video for us as well. WELL DONE, I say. He did a great job!! The captain also announced that there would be complimentary alcoholic beverages served to those of us mooing in the back. A nice gesture. Too bad it took the attendants more than an hour to get to my row, and I wasn't in the back row. Basically, as far as I could tell, they were already exhausted themselves, and chose not to modify their normal procedure one iota to accommodate the situation, because it would have made more work. Here's the thing, though: we had now been sitting in this tin can for 2.5 hours at this point. I think most of us would've killed for anything to take the edge off. Some of us had to wait another hour for that. So the niceties may be missing when they toss you your heated beef brisket (see previous post), but heaven forfend they should rush the beverage service. Okay, here are the lessons we would like to draw from this. You need to encourage your staff, (or yourself as the case may be) to abandon caution and put the customer first when things start to go wrong. Give people license to start modifying procedures. When things go wrong -- and they will in every operation -- take the time to extract the learning and share it as widely as possible. What works. What we should try next time. How to cope with your own stress and still look after customers. That sort of thing. Encourage your staff to act like the captain in this story: show some empathy, talk like a human being, do what you can to alleviate the irritation. Don't pretend it's business as usual. I've been tardy with my posts lately, dear reader, but I have a good excuse. I was out on the road documenting the joys of modern travel for your reading pleasure. I didn't expect much, and they more or less delivered ... "satisfied"
My expectations were low, and they actually did more than I expected ... "very satisfied"
I didn't expect much, and they were actually worse ... "dissatisfied"
I can actually recommend the beef brisket sandwich. But I'd really like some kind of service that doesn't involve tossing me a foil-wrapped thing without any ceremony at all. 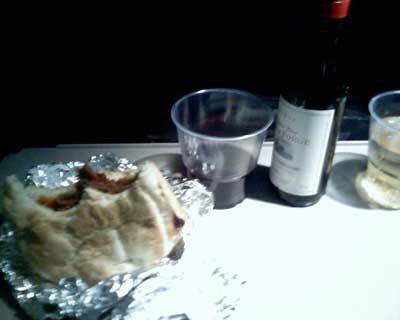 This isn't a meal in any sense I can identify -- it's refueling at best. But the fact that it tasted good actually exceeded my expectations, which were exeptionally low. So I guess I'm satisfied with the food, right? Don't be fooled by customer satisfaction scores -- they're only half of the story. Oh yeah ... about the wine. Stay tuned for the next post, where we discuss service recovery. 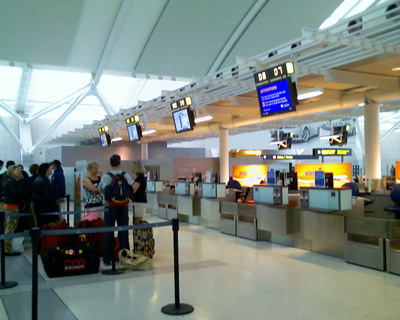 I'm sitting in an airport lounge that feels a bit different... it's Porter Air, at the Toronto Island Airport. A fellow sitting nearby just said to his buddy, "This is civilization!". And indeed, so far this trip has lacked half the hassle of flying out of Pearson. For starters, the lounge is free to everyone. And wireless access is free. 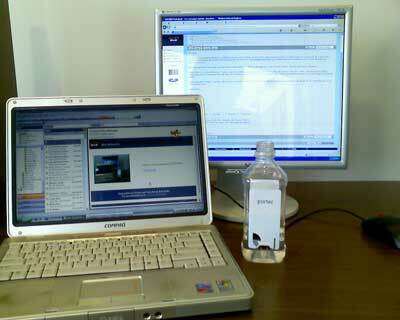 There are nice flat-screen computers like the one shown above, and branded water. The guy beside me -- who has a combat pattern skinned onto his Blackberry -- just finished an espresso. You get here via a short ferry trip from downtown. You can pass the short wait by watching the scoters bob and dive for fish. 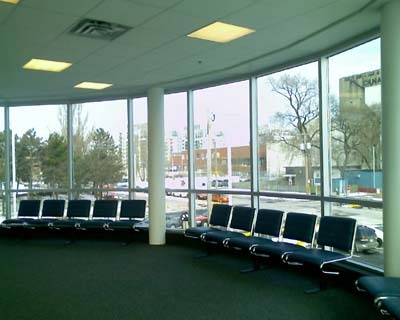 You get to the ferry terminal via a comfortable shuttle bus from the downtown check-in kiosk. 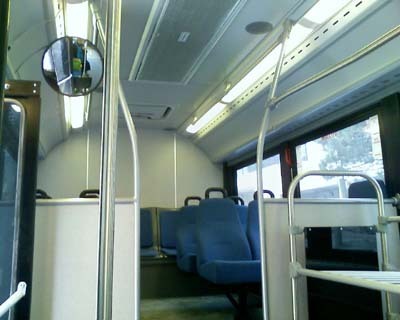 And it's a NICE bus. And all the staff are NICE! They say things like "have a great trip" while giving you a smile. But the main advantage has to be the ease of access from downtown, and no $50 taxi ride to get to the airport. I actually came to my first meeting via public transit, and then walked over to the shuttle kiosk. I have to agree: it feels VERY civilized. I confess I was not in favor of keeping this airport, when it has come up as an issue in municipal politics. And there has been more than enough jiggery-pokery on the funding to keep us taxpayers in a state of rage for years. But as long as this thing is rolling, I plan to give it a try. This is the third post in a series looking at how compliance procedures have infiltrated customer facing environments, and how to meet the challenge without damaging the customer sales and service experience. Given the identical situation, let's look at how different organizations are responding. Since we've all been in an airport, dear reader, this seems like a good place to look. invite you to return soon. Their subtext goes something like this: I know you aren't a terrorist, but we need to pay attention to this and I know you understand why it's so important. Okay? travellers to the USA. They have helpful people directing traffic. might not be fun, but at least it's efficient. So to anyone who doesn't think organization culture counts for much, I invite you to explain this difference. It is possible to balance competing objectives. But management has to actually make the effort.